Maths students at The Sixth Form College, Solihull benefited from a visiting speaker from the University of Warwick last week, which applied mathematical theory to real world issues. 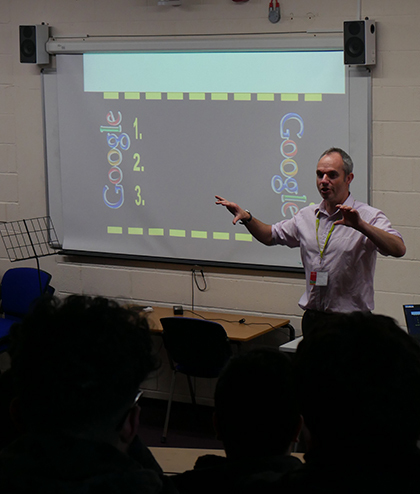 Dr Richard Lissaman, who also works with the Advanced Mathematics Support Programme (AMSP), delivered a talk entitled “Google & Gaming” to Year 12 Mathematics students. The talk touched on simultaneous equations, angles, algebra and vectors and applied these mathematical theories to how Google optimise searches and how computer games graphics are designed.